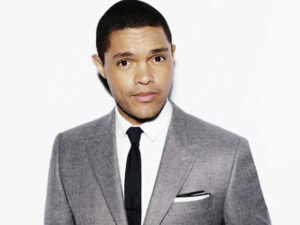 Trevor Noah is a popular South African comedian, writer, producer, political commentator, actor, and television host. He was born to Patricia Nombuyiselo Noah and Robert on 20 February 1984 in Johannesburg, South Africa. In 2002, he began his career as a comedian, presenter, and actor in his native South Africa. He published his autobiographical comedy book Born a Crime in 2016. Noah became a recurring contributor on The Daily Show in December 201. In March 2015, Comedy Central announced that Noah would succeed Jon Stewart as host of The Daily Show; his tenure began on 28 September 2015. On September 14, 2017, it was announced that Comedy Central had extended Trevor Noah’s contract as host of The Daily Show for five years, through 2022. Noah became the first South African stand-up comedian to appear on The Tonight Show on 6 January 2012; and, on 17 May 2013, he became the first to appear on Late Show with David Letterman. Noah was the subject of the 2012 documentary You Laugh But It’s True. The same year, he starred in the one-man comedy show Trevor Noah: The Racist. He was born on the 20th of February 1984 in Johannesburg, South Africa. As of 2019, he is 35 years old. Noah had since 2015 been in a relationship with American model and singer Jordyn Taylor. In early 2019, Noah and Jordyn Taylor have called it quits. After dating for four years, Noah and US real estate agent Taylor have ended their relationship. She made the announcement during a Q&A Instagram Story session with fans after opening up about her solo vacay. His mother whose name is Patricia Nombuyiselo Noah is Black and of Xhosa ethnicity, while his father, Robert, is White and of Swiss German ethnicity. At the time of his birth, under apartheid his parents’ interracial relationship was illegal. His mother was jailed and fined by the South African government while his father later moved back to Switzerland. Noah was raised by his mother and maternal grandmother, Nomalizo Frances Noah. His father is known as Robert and he is of White and of Swiss German ethnicity. He moved back to Switzerland a few years after his son’s birth. His mother who is known as Patricia Nombuyiselo Noah is Black and of Xhosa ethnicity. In 1992, Noah’s mother, Patricia Nombuyiselo, was married to Ngisaveni Abel Shingange, and they had two sons together, Andrew and Isaac. Trevor and his mother were both physically abused by Shingange, and the couple divorced in 1996. In 2009, after she became engaged to Sfiso Khoza, Shingange shot her in the leg and through the back of the head, stopping when the gun jammed; she survived as the bullet went through her head, avoided the brain and all major nerves and blood vessels, exiting with minor damage to her nostril. When Noah confronted him over the phone about the shooting, Shingange threatened his life, prompting Noah to leave Johannesburg for Los Angeles. He is believed to have an estimated net worth of about $13 million making him one of the richest South African comedians ever. JOHANNESBURG – Daily Show host Trevor Noah and Jordyn Taylor have reportedly ended their relationship. During a Q&A Instagram Stories session, Taylor revealed that they were no longer together and things ended during the American summer. “Of course I love him. How could you not love him? I love him so much but you guys should know we broke up this past summer but yeah I love him”, said Taylor in response to the question. Rumors about the couple’s romance first surfaced towards the end of 2015 but Noah officially confirmed the relationship during an interview with Anele Mdoda in 2016.